Many of us have had personal, perhaps desperate, moments with slate. The schoolroom blackboard was a proving ground of our formative years. When we were called to the front of the class to perform long division, diagram a sentence, or spell “Mississippi,” we gazed into the smooth, black void of the slate blackboard, hoping for a glimmer of divine intervention to illuminate a path to the solution. The slate blackboard was introduced to American schools in 1801, at West Point Military Academy. In all their dusty glory, slate blackboards proved an enduring fixture in schools for nearly 150 years, until they were eventually replaced by ceramic-coated steel chalkboards. In their heyday in the early 1900s, slate quarries in Pennsylvania, Vermont, Maine, and Virginia produced roofing tiles as their primary product. Slate shingles are naturally waterproof, fireproof, and durable. Depending on the grade of the stone, a slate roof can last from 70 years to over 200 years. But by the late 1940s, slate roofs gave way to modern asphalt shingles. Now, slate roofs are found mostly on historic buildings, museums, college campuses, or houses we can’t afford. But slate is not out of our lives completely, thank goodness. 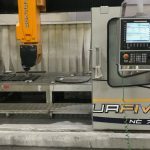 It remains an especially useful stone due to its tendency to naturally cleave into thin layers. Slate has a consistent, dense grain that lends it durability. Slate is a beautiful choice for flooring, wall tile, or bathrooms. Slate can be warm and rustic, or sleek and modern. Either way, it’s trouble free and timeless. 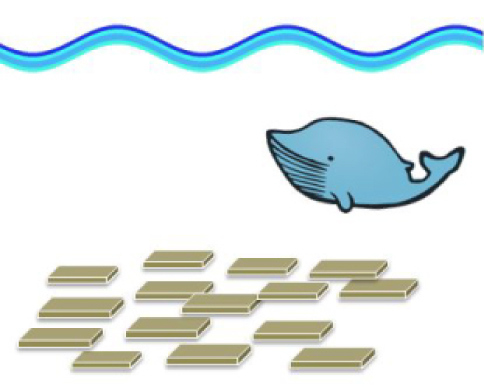 Shale is made of flat-laying clay particles that settle out on the ocean floor. What Gives Slate Its Traits? Slate is a metamorphic rock. It starts out as marine mud, composed of clay, silt, and organic material that settles to the bottom of the cold, dark, ocean. There’s not a lot of action at the ocean floor. It takes millions of years just to accumulate a decent amount of mud. Over time, deposits of mud get blanketed by new layers, compressed, and hardened into shale. Shale is a sedimentary rock that forms in thin sheets and often contains fossils. Aside from the cool fossils, shale is not a particularly useful rock. Its layers are brittle, and the clay minerals are quick to weather apart. 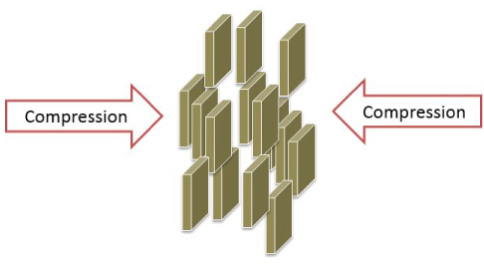 But sometimes a layer of seafloor mud becomes trapped in a collision between continents. Then things get exciting, as the whole region crumples together, causing the rocks to become bent and folded, buried more deeply, and heated. 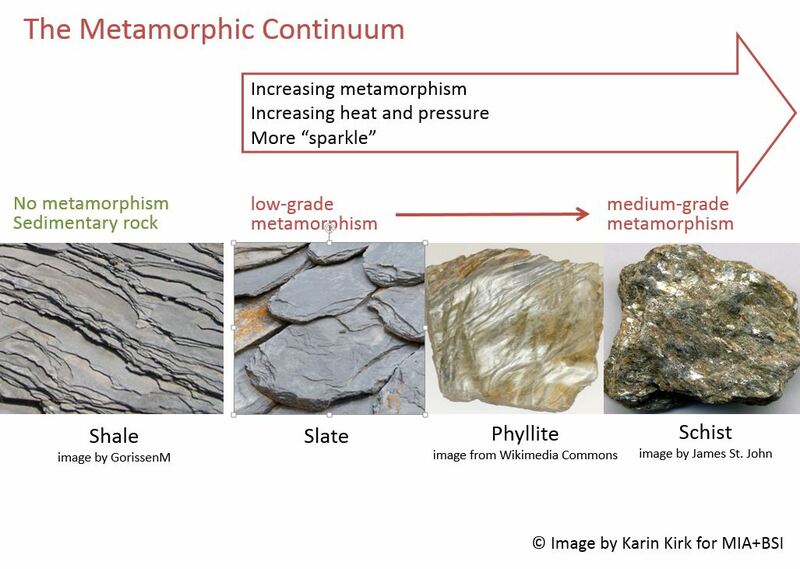 This metamorphic process does not melt the shale. Slate is made of compressed and recrystallized clay materials. 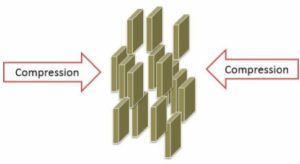 Instead, compression re-aligns the flat mineral grains, giving the rock a pronounced linear texture that often is at right angles to the original sedimentary layering. As the rock heats up, the minerals recrystallize and grow into each other, yielding a stone that is non-porous and sturdy. Slate is fine-grained because the original mud particles were tiny. This makes slate smooth and sleek, as well as impermeable to water. 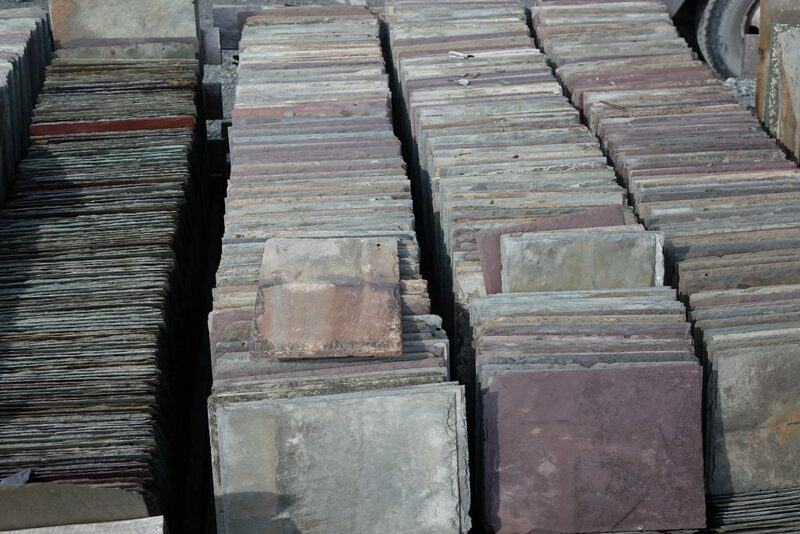 Slate is commonly grey, but can also be black, green, purple, brown, or brick red. In most cases, the color of slate tells us something about the marine environment where the mud was deposited. Black and dark grey slates get their color from organic carbon. Red and purple slates are tinted by the oxidation of iron, which means that the ocean water was shallow or there were currents that mixed oxygen into the water. Green slate is the opposite of red – it’s caused by the reduction of iron in quiet or deep waters where little oxygen was available. 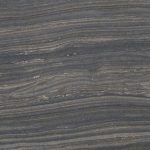 A mottled, rusty tone on the surface of some slates is caused by groundwater that percolated along the natural seams in the rock, oxidizing the minerals along the way. The amount of heating and squeezing a given stone underwent depends on where it was in the tectonic collision zone. The more intense the heat and pressure, the more durable the stone became. A slight amount of metamorphism creates a soft slate. Further compression produces a harder slate. As the rock is exposed to increasing heat and pressure, its minerals grow larger, and transform from dull clay to sparkly mica. At this point the stone is geologically termed phyllite. Phyllite shares its name with phyllo dough – as they are both made out of thin layers. (Phyllite is not nearly as tasty, and makes terrible baklava.) Phyllite looks similar to slate but has a sparkle or a metallic sheen to it. If the stone is heated even more, the mica minerals get bigger and the rock becomes glittery, creating a rock called schist. There is no definitive point when shale becomes slate, slate becomes phyllite, and so on. It’s a continual gradation, depending on the conditions the stone endured. Thus you are likely to encounter stones from various points along the metamorphic spectrum. A general rule of thumb is that the degree of sparkle in a stone increases with more intense metamorphism. This “sparkle index” shows us that shale is dull grey, slate is slightly glossy, phyllite takes on a sparkly sheen, and schist is full-on glitter. In the natural stone vernacular, the term “slate” refers to stones that willingly cleave along thin layers. At a stone yard or tile showroom, “slate” will include actual slate, along with phyllite and schist. When selecting slate, you can use the idea of the metamorphic spectrum to help you identify stones that are suitable for your needs. Low-grade slate, which has not been subjected to much metamorphism, may split along its layers. Higher grades of slate are more robust; and phyllite is also strong and resistant to cracking. Schist can sometimes be troublesome because the larger mica grains are prone to peeling off. However, some schists have less mica and more quartz, and are exceptionally strong. Your best bet for evaluating a given stone is to examine the edges and look for signs of flaking. Also, note how much sparkle the stone has. A bit of shine is an indication of a stronger slate. Today, slate is most commonly used as flooring. Most slate tile is split apart, rather than cut with a saw. This produces a slightly irregular “cleft” surface that adds texture and interest to a room. 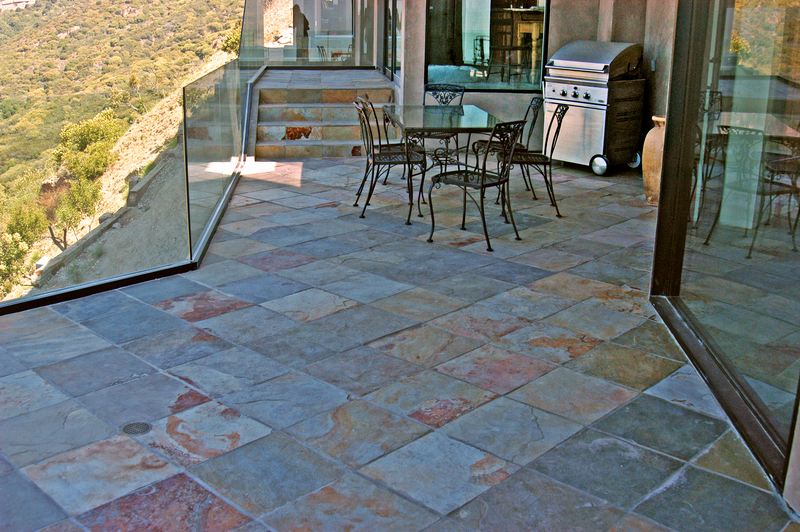 Slate’s colors are deepened with an enhancing sealer, which emphasizes the natural variations in the stone. California Gold Slate. Photo Courtesy of M S International. 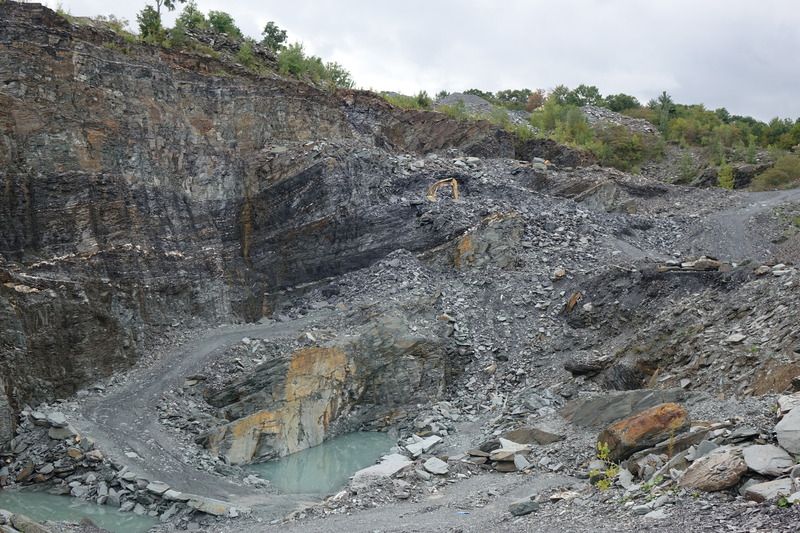 While slate was originally used mostly in the Northeastern US due to the proximity of slate quarries, slate’s popularity has spread nationwide. Quarries in the US still operate, and slate from India, Asia, and South America have also become commonplace. 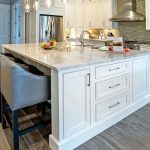 At the Montana Tile and Stone showroom in Bozeman, Montana, owner Price Wills and fabricator Ari Kaufman praised slate flooring as carefree, durable, and in high demand. They reported that porcelain tile that is manufactured to look like slate has captured some of the market for flooring tile. But their allegiances clearly lie with natural slate. One advantage is that slate is easy to cut, shape, and trim, allowing for nearly limitless patterns. Unlike porcelain, the trimmed slate pieces are reusable elsewhere within a pattern, and “you can get creative with it,” explained Kaufman. Wills described “a push for authentic materials” among his clients. “You just can’t replace the real McCoy.” Since their showroom opened in 2001, natural slate flooring has remained a customer favorite, and is particularly popular for the rustic aesthetic of Montana homes. Slate has evolved from a schoolroom staple, to fireproof roof, to a classic flooring material. 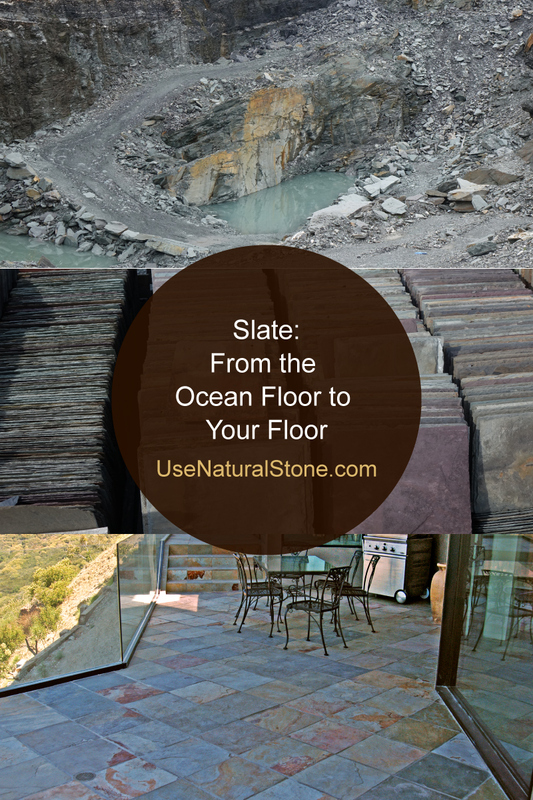 In every application, slate is reliable and undemanding. After all, if it can last for millions of years on the ocean floor, it will serve you well on your own floor too.